AdipoGen Life Sciences offers a broad panel of >500 natural products, from bacterial, fungal, marine and plant sources. 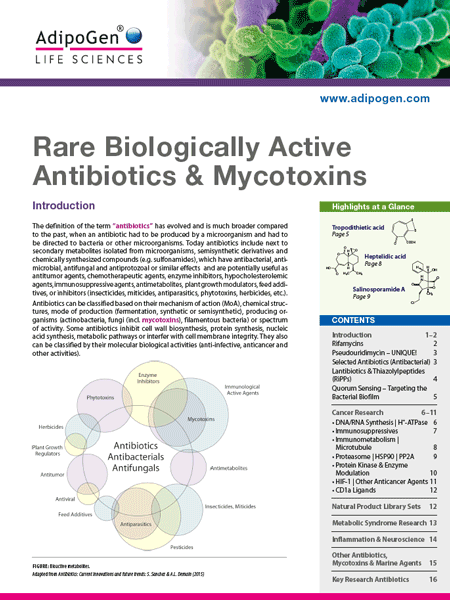 This panel includes known active and well characterized natural products in combination with unusual and difficult to isolate compounds, which are unique to AdipoGen Life Sciences. All compounds are structurally determined, purified and analytically validated. Included in this panel a key standard research antibiotics, rare metabolites/antibiotics with new chemical structures (often only described once in literature and afterwards lost to research) or old already forgotten substances for lead drug research, seeking new “antibiotics” with new mode of actions and new molecular targets. Released October 2018. 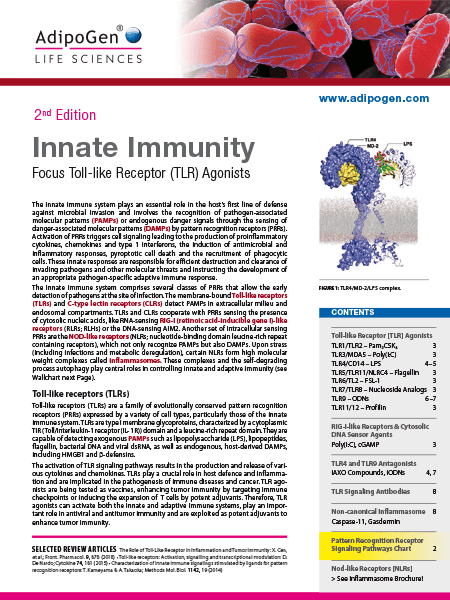 This brochure includes a cell metabolism signaling wallchart with relevant small molecule inhibitors. Released July 2018. 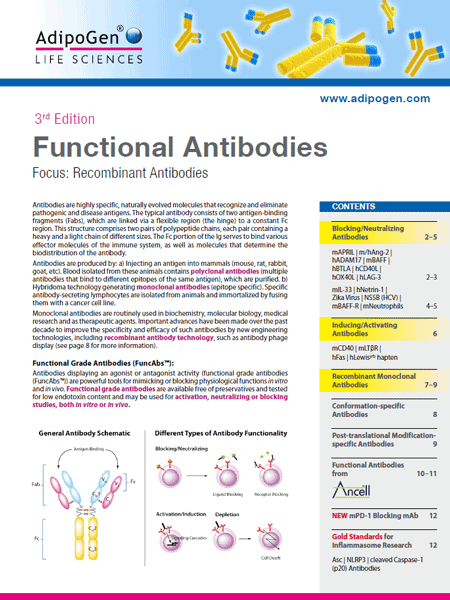 Antibodies displaying an agonist or antagonist activity (functional grade antibodies (FuncAbs™)) are powerful tools for mimicking or blocking physiological functions in vitro and in vivo. 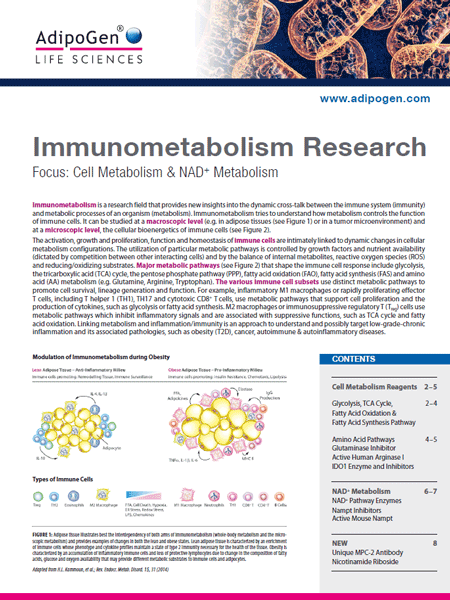 Adipogen Life Sciences offers functional grade antibodies free of preservatives and tested for low endotoxin content and useful for activation, neutralizing or blocking studies, both in vitro or in vivo. Adipogen Life Sciences also offers recombinant monoclonal antibodies (RecMAbs™) generated by antibody phage display. An important attribute of the RecMAbs™ phage display approach is the ability to design selection strategies to generate antibodies with customized functions (FuncAbs™). Released February 2018. The proinflammatory cytokine IL-36gamma is highly expressed in skin epithelial cells and in several myeloid-derived cell types. 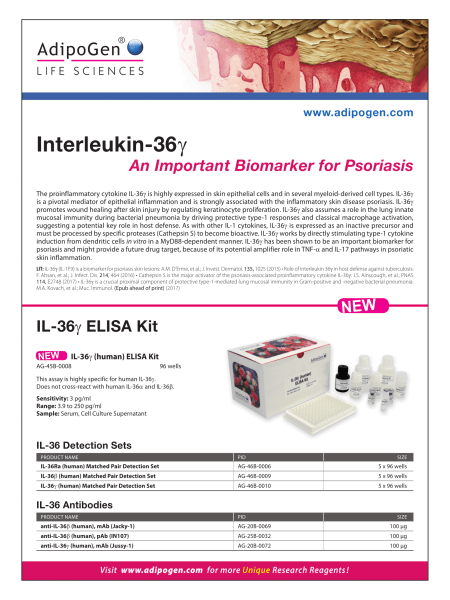 IL-36gamma is a pivotal mediator of epithelial inflammation and is strongly associated with the inflammatory skin disease psoriasis. Released November 2017. 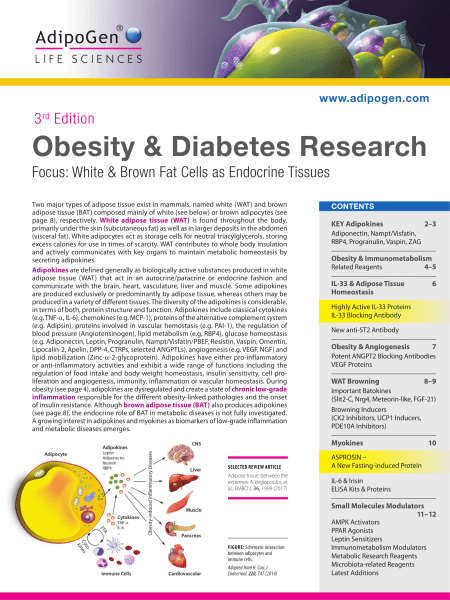 Focus: White & Brown Fat Cells as Endocrine Tissues. Also included are the CyMAX™ Cytokine Assays from Abfrontier and the Oxidative Stress Assays from JaICA. Updated June 2017. 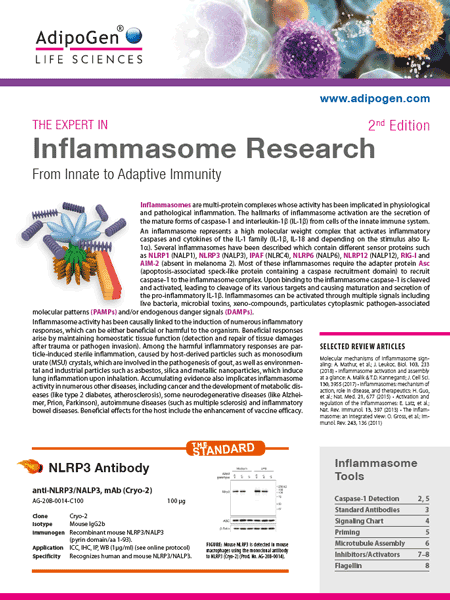 AdipoGen offers a broad range of unique tools for neuroinflammation and neurodegeneration research. 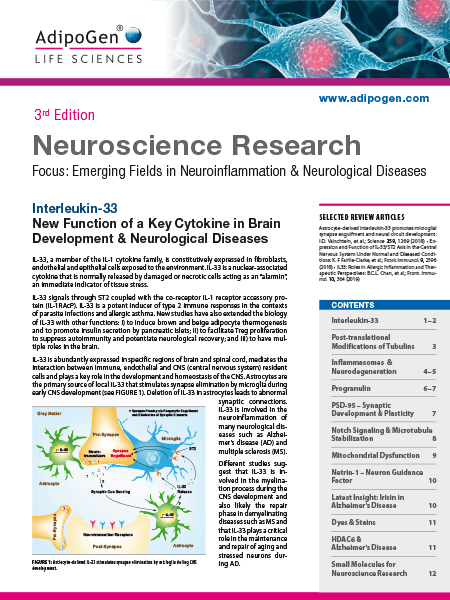 This includes biologically active Netrin-1 for axon outgrowth studies, the best inflammasomes research reagents to study the activation of neuroinflammation, biologically active Notch ligands, unique progranulin ELISA Kits and proteins, a broad range of adiponectin reagents, many Neurochemicals (including Gangliosides) and a unique polyglutamylation antibody. Updated December 2016. 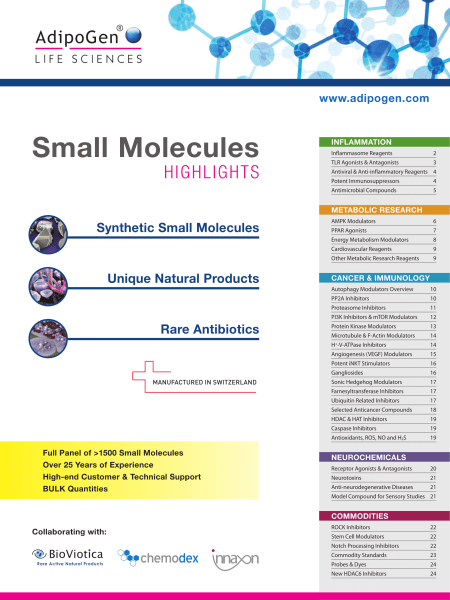 AdipoGen Life Sciences is a manufacturer of small molecules, rare antibiotics and natural products. 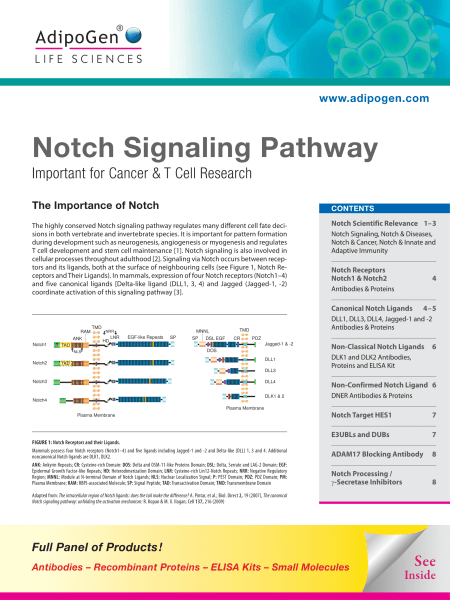 This brochure provides only a slight glimps of the broad range of biochemicals available from AdipoGen Life Sciences. 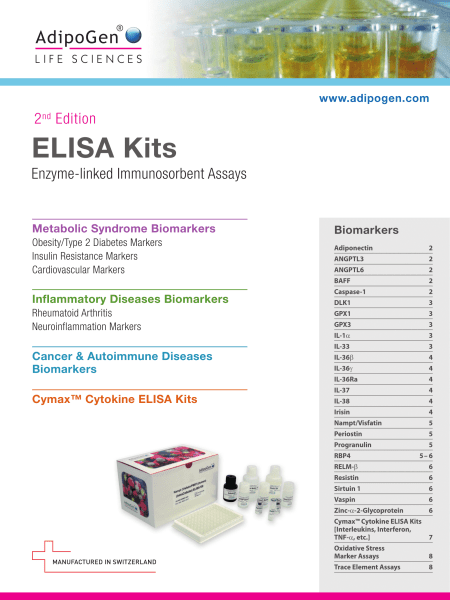 Inhibitors, activators, modulators, probes, dyes or commodities complement AdipoGen Life Sciences excellent product range in the fields of biologicals and ELISA Kits. Released November 2015.